Don't you have an oven but love to make French Fries at home? You might think that you can make homemade french fries by deep frying only. Many of you might already know the fact that deep frying potatoes are not good. The next option you could think immediately would be baking. If you are someone who do not own an oven, then this is not an option for you. So, what will be the last option? 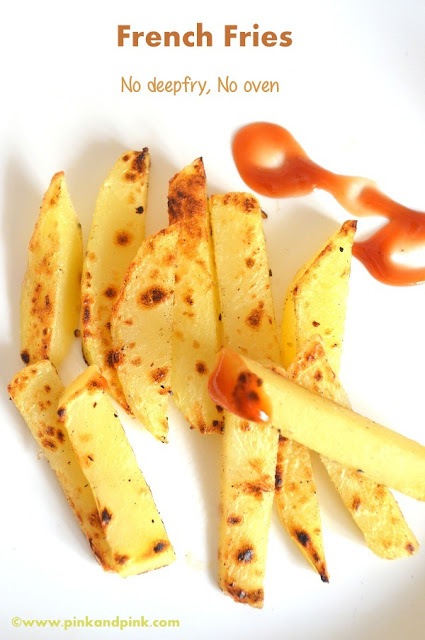 This 'Homemade French Fries Recipe on Stove Top Tawa Without Deep Frying, Without Oven, Low Fat' post will be the answer for you. This is the third time I make French Fries at home. I had already tried to make homemade french fries 2 times before. Though I managed to make some tasty homemade french fries without deep frying in the first attempt with boiling and toasting, I failed to do in the second attempt as I tried to completely bake them without oven as I bake cake without oven. So, I stick to boiling and toasting when I make french fries at home. How to make French Fries at home without oil? Adding oil can help you to make crispy french fries. If you do not expect the French fry to be more crispy, you can make French Fries with no oil. French Fries without oil might not be the perfect french fries as you wish. But definitely they are the low fat french fries. Let me tell you that you might find it difficult to make homemade french fries for the first few times. Once you understand the process, you can make french fries easily. It is quiet easy to make french fries at home if you are doing for a small family of 3-4 members. If you are making it for a large group, get help from someone else. Or drop this option, as it is time consuming and needs regular attention. If you are going to be the only person who make this homemade french fries at home, you will find it difficult. 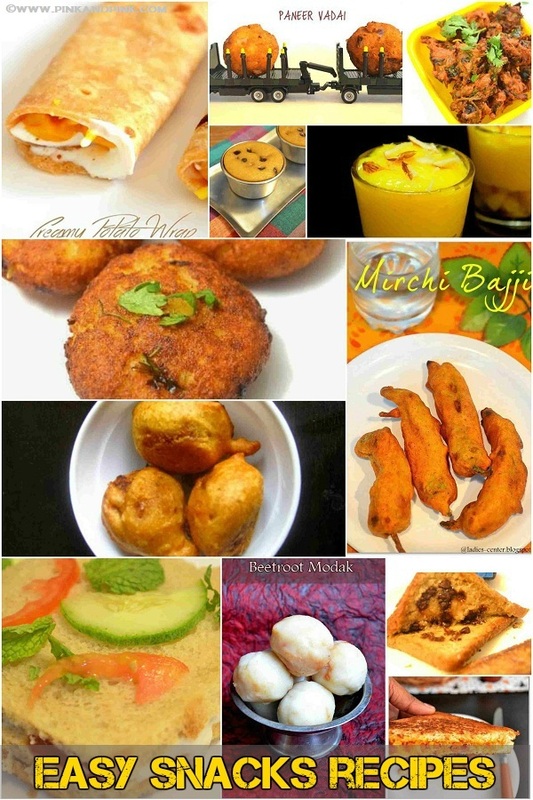 Choose some other easy snacks recipe instead. Homemade French fries are healthy. There is no doubt. But frequent intake of potatoes is not healthy as you are aware of. Though Potato has important nutrients like Vitamin C, Potassium, Vitamin B6 and much more, do not take it quite frequently. You can make French fries and other potato dishes occasionally but not frequently. Potatoes are high in Carbohydrates. Frequent intake of potatoes might lead to obesity, diabetes and heart diseases. In southern part of Tamil Nadu, french fries is not popular. But still deep fried potato chips are still popular. You can make french fries at home without oven at all. Adding oil can help you to make crispy french fries. If you do not expect the French fry to be more crispy, you can make French Fries with no oil. Cut the potato into slices and keep the slices immersed in water for 10 minutes. Cook potato slices with water and salt in a pan. 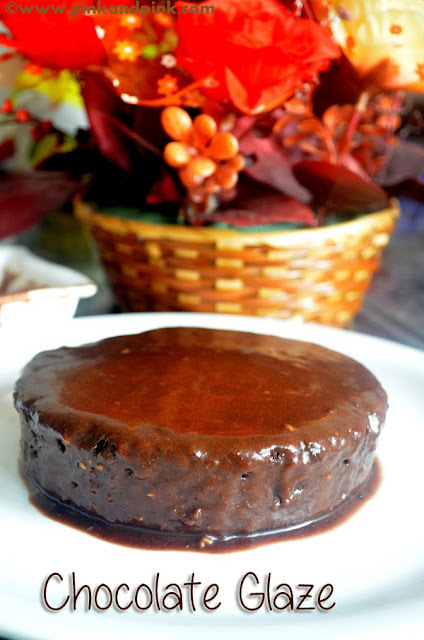 Switch off the stove once they are cooked and run the slices under cold water. 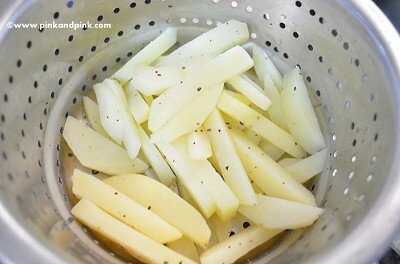 Allow the potato slices to dry for few minutes under fan in a colander. Sprinkle pepper powder on the slices as much as you want. Check for salt and sprinkle salt if required. 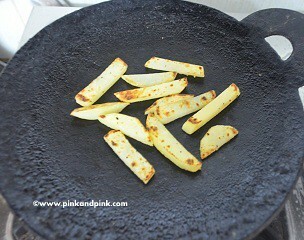 Toast the sides of potato on a tawa till the sides become crisp. 1. Peel the skin off the potato. Keep a bowl of water ready. 2. Cut the potato into thin and long slices and keep each slice in water as soon as you cut. 3. Allow the potato slices to be immersed in water for 10 minutes. 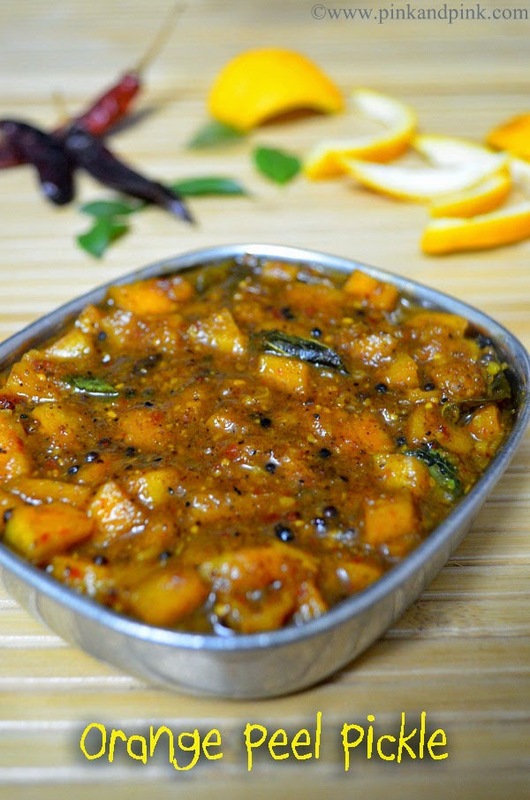 This will allow you to drain the excess starch. 4. Drain the excess water after 10 minutes. 5. Heat a pan and add the potato slices. Add water just to immerse the potato slices. Add required amount of salt. 6. Cook in medium flame till the potato becomes soft but not mushy. 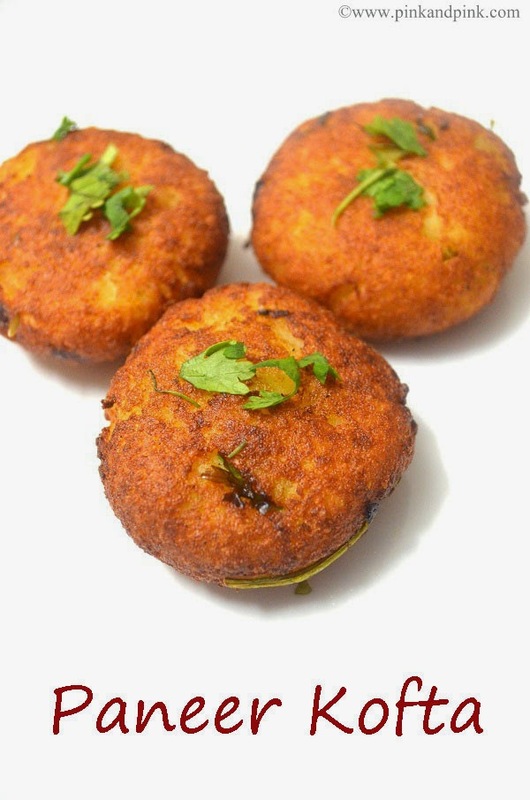 The potato should not become mushy as you cook for poriyal and other dishes. When you insert a knife, you should be able to cut the slice with a knife but not very easily. In the next step, we are just going to toast the outer side of the slices. So, cook till how much you want to cook the inner side of the potatoes. The inner side will not get cooked further. You might have already tasted french fries outside. Get it cooked to that consistency. Switch off the stove. Drain excess water immediately. Run the slices under cold water. Keep it in colander to allow the excess water to get drained completely. Toss a little bit. You can keep the slices under a fan for few minutes to remove the moisture. 7. Sprinkle pepper powder on the slices as much as you want. Check for salt and sprinkle salt if required. 8. Take a teaspoon of oil and grease your palm and fingers. Coat the potato slices with that oil. 9. Heat a tawa in medium flame. Grease the tawa with oil. I did not use non stick. I used normal iron tawa. So, I had to grease the tawa with little amount of oil. 10. Place the potato strips on tawa and toast the top and bottom or all the sides of potato. You will see brown spots here and there initially. Toast till the potato slices has become crisp. Take care not to burn. Patience is the key here. Drizzle few drops of oil around the slices as and when required. 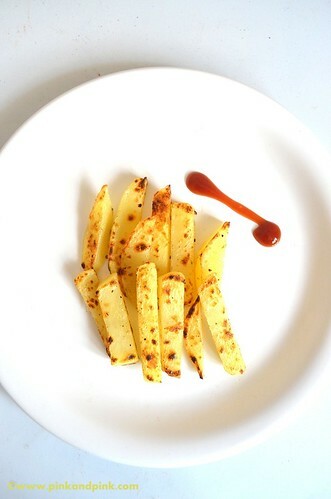 Homemade French Fries on Stove Top Tawa Without Deep Frying, Without Oven, Low Fat is ready. 1. Keep water ready in a bowl before cutting potato. 2. Keep the potato slice immersed in water as soon as you cut each slice so that the potato will not change in color. 3. Cook the potatoes as mentioned in the instructions. Under-cooked potatoes will not be tasty. 4. Do not forget to add salt while boiling. 5. 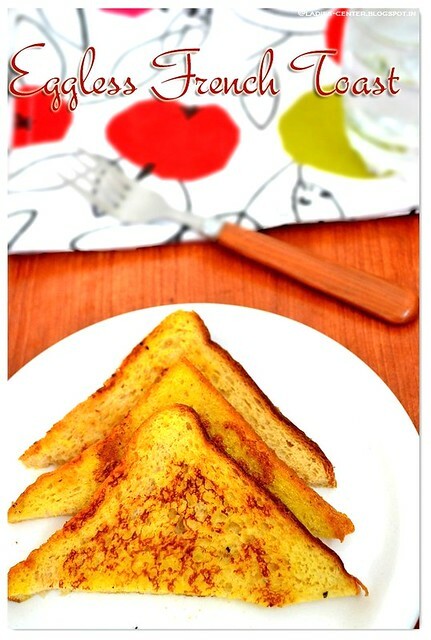 Toast the sides well till you see brown spots. You can toast it as much as you can without burning. Hope you liked the post 'How to make French Fries at home - French Fry Recipe on Stove Top, Tawa, Without Deep Frying, Without Oven'. Please try french fries at home and let me know how it comes for you.